Although reviews have become increasingly reliable, the issue of fake reviews not only remains but has transformed into a multifaceted complication. Can you spot a fake? Some businesses choose to manipulate the opinions of prospective customers by influencing reviews. Posting fake reviews, positive or negative, is unethical and illegal. 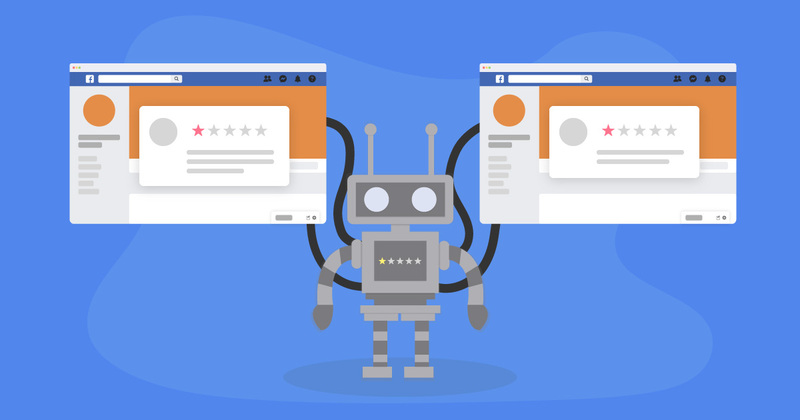 Plus, for every advance in technology that helps enable the spread of fake reviews, there are counteracting advances in the tools to help detect and trace them. First, we’ll explore the causes of fake reviews and technological innovations affecting online reviews. Then we’ll go into detail about the types of fake reviews businesses might encounter and how to handle them. Sabotaging a competitor’s or padding one’s own online reviews is one of the oldest dirty business and political tactics to exist. Gossip goes back as far as human history. Technology has simply changed how it looks. Online reviews are the new word-of-mouth, which makes them extremely influential in the purchasing process. By faking online reviews, business owners and marketers are practicing a form of social engineering. In this context, social engineering is defined as manipulating the social perception of a brand (and sometimes of a business owner) in order to influence the general public to take a desired action. For online reviews, that action is to choose one business over another using fake reviews. In recent news, you may have heard this term more in connection with political elections and fake social media profiles. However, the form of these fake reviews continues to evolve. We don’t just help you display your best reviews, we help you get them too. Subscribe to our newsletter for business reviews advice and more. In order to understand the tools and resources available to both attackers and the attacked, first, we have to understand the kinds of fake reviews that exist. From fake experiences to purely bot-created numerical rating, there are 4 kinds of fake reviews we’ll address here. In general, people take the time to leave fake reviews themselves when they are disgruntled. That makes these kinds of reviews easier to spot. Those people also ask their friends to help them leave fake reviews. This tactic is meant to get around bot detection and make the reviews seem real. But, it’s still fairly easy to spot a fake review if you know what you’re looking for. As in the case of some unfortunate businesses, you may experience a sudden flood of negative reviews. They usually all come in on the same day and have no content included. When there’s no content to dispute, finding ways to contest the review is that much harder. Facebook, Yelp, and Google all allow you to dispute the content of the review, not the review itself. When this kind of thing occurs, it raises a huge red flag to companies like Yelp and Facebook. It makes your business look guilty of attempting to cushion your own review rating. That there’s no content included gives you nothing to dispute which makes it impossible to report. Luckily, there are other ways you can fight back against both kinds of bot-generated reviews with no content. On the other end of the spectrum, fake reviews written with automated intelligence have also gotten increasingly popular. In the past, AI was not advanced enough for these reviews to be taken too seriously but they’ve drastically improved. Bot-generated reviews are usually easy to detect and come in large groups, sometimes hundreds in one day. The majority of these kinds of attacks usually have no content included with them. But those that do are using better and better software. This kind of technology “opens up paths for malicious actors to use these tools to generate fake reviews, comments or news articles to influence the public opinion.” (Source) That’s why engineers at MIT and Harvard have partnered to combat them with their automated intelligence detection software. All of this technology is brand new, but there are pieces of it available online in the Open Source community. The GLTR test can be used to see if known AI-generated text was used in specific instances. So, if you think a review was written by a robot, drop the text in there to find out. In general, software-generated fake reviews are usually not well-done enough to convince most people. They would need to originate from the most advanced technology available, and that’s just now coming out. Regardless, at least if there is content, you can dispute a review. Below are links to our guides on disputing reviews for a few popular platforms. Don’t let fake reviews get you down, especially if your dispute to the review platform failed. There are a lot of things you can do to fight against them. Reporting reviews fails a lot of the time, especially on Yelp. But, you can find other ways to contact these companies. For instance, the best way to get help is to spend money with them. Advertisers have, and always will have, special privileges. Yelp, Google, and Facebook have separate support departments for different issues. Those who use ads get much faster and more willing support in general. That’s where these organizations make their money, so it’s where they want to make people the happiest. If you find that you’re having issues disputing review content you believe is fake, then reach out through another support channel. So many people complain about reviews that even if you choose tech support, you’re more likely to find someone who can help. But, make sure you have a legitimate issue that’s affecting your bottom line. Don’t waste their time. When you do get in touch, if you have evidence from the fake text analyzer discussed above, then submit that to them. There is no guarantee that they will accept this as evidence, but it certainly helps your claim. If there’s no text to submit, things get a little harder. Pointing out patterns like these can help you raise the suspicion of fake profiles. Due to the detrimental implications of fake profiles for social engineering and the legitimacy of the platforms in question, reporting fake profiles is much more likely to gain a response. But if you’re not watching your reviews closely in the first place, gathering this evidence is difficult. All of this really clearly highlights the importance of paying attention to your reviews and not falling victim to common fallacies. If you’re paying attention, you’ll find out about attacks much sooner. You’ll also have a leg to stand on when it comes time to dispute a fake review. Claim, monitor, and use the tools provided by major reviews platforms. If you don’t, you will have more work to do when your business gets attacked and less positive revies to counterbalance the attack of negativity. Responding to your reviews is also a key part of this process. Monitoring only goes so far. Keep best practices for responding to negative reviews in mind when responding to fake ones as well. Even when they’re wrong, there are tactful approaches to take that can help. One restaurant who was attacked by 71 1-star reviews on Facebook in a single day planned on creating a new business page and turning off the ability to leave a recommendation. The business in question began the process of starting a new page, but after reaching out to advertisers, gaining media attention, and posting about it on their page, Facebook silently removed the illegitimate reviews. Now they plan to merge the old and the new page and leave their reviews enabled. People read online reviews before they visit a business and they know how review platforms work for the most part. If you have yours turned off on Facebook, it looks suspicious. Don’t deactivate, but instead focus on fighting back. You have many other options, especially if you were attacked by an influx of blank 1-star reviews. If your overall rating suffered so severely that it’s noticeable and it’s hurting your business, then be transparent. Let your followers, email newsletter subscribers, and friends know that you need them to leave genuine reviews with what they love about your business to combat the attack. Other business owners have tried this and it worked. Plus, the real content side by side with fake content, or none at all, is a lot more convincing. Posting and emailing is one way to get more reviews from happy customers, but you should also build habits into your everyday routine to further your efforts. Dozens of experts agree that businesses should “be proactive about earning positive reviews from happy customers,” (Forbes). When reviews are clearly a focus for your business, more customers are inclined to give them. Fake reviews are prevalent, but you can defeat them. Use the methods above, or reach out to marketing experts that specialize in review marketing. Have you experienced fake online reviews? Let us know about your experience in the comments.